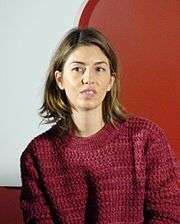 Sofia Coppola was born in New York City, New York, the youngest child and only daughter of set decorator/artist Eleanor Coppola (née Neil) and director Francis Ford Coppola. Her father is of Italian descent. At fifteen, she interned with Chanel. Coppola is a 1989 graduate of St. Helena High School. She later attended Mills College and the California Institute of the Arts. After dropping out of college, Coppola started a clothing line called Milkfed, which is now sold exclusively in Japan. Let's see. Did I not wanna do it? Um. I was game. I was trying different things. It sounded better than college. I didn't really think about the public aspect of it. That took me by surprise. The whole reaction. People felt very attached to the Godfather films. I grew up with them being no big deal. I mean, I understand they're great films but... I dunno. I'm not surprised. It makes sense that people would have an opinion about it but I got a lot of attention I wasn't expecting. I was going to art school anyway so I was able to get back to what I was doing. It was before the Internet so magazines would come out but then the next month they were gone. There wasn't even as much paparazzi around then. Coppola also acted in her father's films The Outsiders (1983), in a scene where Matt Dillon, Tommy Howell, and Ralph Macchio are eating at a Dairy Queen; Rumble Fish (1983); The Cotton Club (1984); and as Kathleen Turner's sister Nancy Kelcher in Peggy Sue Got Married (1986)  who she would later work with on her feature film directing debut, The Virgin Suicides. Frankenweenie (1984) was the first film that she performed in that was not associated with her father; however, it often goes unnoted due to her stage name "Domino", which she adopted at the time because she thought it was glamorous. The 1989 short film, entitled Life Without Zoe, was released as part of a tripartite anthology film New York Stories, and was co-written by a teenage Coppola with her father, who also directed the film. After she was critically panned for her performance in The Godfather Part III, for which she was named "Worst Supporting Actress" and "Worst New Star" at the 1990 Golden Raspberry Awards, Coppola ended her acting career, although she appeared in the 1992 independent film Inside Monkey Zetterland, as well as in the backgrounds of films by her friends and family: for example, she appeared as Saché in George Lucas' Star Wars: Episode I – The Phantom Menace in 1999. She has since been quoted as saying that she was not hurt by the criticism from her role in The Godfather Part III, because she never especially wanted an acting career. Coppola also appears in several music videos from the 1990s: The Black Crowes' "Sometimes Salvation"; Sonic Youth's "Mildred Pierce"; Madonna's "Deeper and Deeper"; The Chemical Brothers' "Elektrobank", which was directed by her future husband Spike Jonze; and later Phoenix's "Funky Squaredance". Coppola's first short film was Lick the Star (1998). It played many times on the Independent Film Channel. She made her feature film directing debut with The Virgin Suicides (1999). It received critical acclaim upon its premiere in North America at the 2000 Sundance Film Festival and was released later that year. Her second feature was Lost in Translation (2003). Coppola won the Academy Award for her original screenplay and three Golden Globe Awards including Best Picture Musical or Comedy. After Lina Wertmüller and Jane Campion, Coppola became the third female director to be nominated for an Academy Award for Directing and the second to win the Original Screenplay award, after Campion in 1994 (Wertmüller was also nominated), thus making a pattern for the female directors to be nominated for both awards. Her win for best original screenplay in 2003 made her a third-generation Oscar winner. In 2004, Coppola was invited to join the Academy of Motion Picture Arts and Sciences. Her third film was the biopic Marie Antoinette, adapted from the biography by British historian Antonia Fraser. Kirsten Dunst plays the title character, who marries King Louis XVI, played by Jason Schwartzman, Coppola's cousin. It debuted at the 2006 Cannes Film Festival where, despite boos in the audience, it received a standing ovation. Critics were divided. Her fourth film was Somewhere (2010). The movie was filmed at Chateau Marmont. The plot focuses on a "bad boy" actor portrayed by Stephen Dorff who is forced to reevaluate his life when his daughter, played by Elle Fanning, arrives unexpectedly. In November 2010, Coppola was interviewed by Joel Coen, who professed his admiration of Coppola's work, at the DGA screening of Somewhere in New York City. Coppola's next film The Bling Ring (2013) was based on actual events centered around the Bling Ring, a group of California teenagers who burgled the homes of several celebrities over 2008 and 2009, stealing around $3 million in cash and belongings. Emma Watson, Taissa Farmiga, Leslie Mann, Israel Broussard, Katie Chang, and Claire Julien starred in the film. The film opened the Un Certain Regard section of the 2013 Cannes Film Festival. In March 2014, it was reported that Coppola was in negotiations to direct a live-action adaptation of The Little Mermaid from a script by Caroline Thompson. However, in June 2015, it was announced Coppola had dropped out of the film due to creative differences. In October 2014, Bill Murray announced on The Ellen DeGeneres Show that he and Coppola were working on a Christmas special. He stated that they were in the early stages of planning and no network was involved at the time. In May 2015, the first trailer for A Very Murray Christmas was released along with news that the special would be released in December of that year by Netflix. Coppola is set to direct a remake of the 1971 western film The Beguiled starring Nicole Kidman, Elle Fanning and Kirsten Dunst, due for release in 2017. In the mid-1990s, she and best friend Zoe Cassavetes helmed the short-lived series Hi Octane on Comedy Central which spotlit performers in underground music. The show was cancelled after four episodes. In December 2008, Coppola's first commercial premiered during an episode of Gossip Girl. The advertisement which she directed for the Christian Dior fragrance Miss Dior Chérie which was shot in France with model Maryna Linchuk was very well received and continues to be popular on YouTube. At the beginning of the 1990s, she was often featured in girl-oriented magazines like Seventeen and YM. In 1998, she cofounded the clothing line Milk Fed in Japan with friend Stephanie Hayman in cooperation with Sonic Youth's Kim Gordon. In 2002, fashion designer Marc Jacobs chose the actress/director to be the 'face' of his house's fragrance. The campaign involved photographs of her shot by photographer Jürgen Teller in his signature over-exposed style. In the July 2013 issue of Elle, photographs shot by Coppola of Paris Hilton at her Beverly Hills mansion (which makes a cameo in The Bling Ring) were featured. On May 2016, the New York Times reported that Coppola would be making her debut as an opera director. She is currently directing a production of La Traviata for the Teatro Nazionale in Rome, Italy. Coppola was nominated for three Academy Awards for her 2003 film Lost in Translation, in the categories of Best Picture, Best Director, and Best Original Screenplay. She would go on to win for Best Original Screenplay, but lost the other two nominations to Peter Jackson's The Lord of the Rings: The Return of the King. Her win for Best Original Screenplay resulted in her family becoming the second three-generation Oscar-winning family, her grandfather Carmine Coppola and her father Francis Ford Coppola having previously won Oscars. The first family to achieve this feat was the Huston family: Walter, John, and Anjelica. In 1999, Coppola married director Spike Jonze, whom she had first met in 1992, and they divorced in 2003. In an official statement, Coppola's publicist explained that the divorce decision was reached "with sadness". It is widely believed that a minor character in Lost in Translation is based on Jonze, as Coppola stated after the film's release, "There are elements of Spike there, elements of experiences." Coppola married musician Thomas Mars on August 27, 2011 at Palazzo Margherita in Bernalda, Italy. They met while producing the soundtrack to The Virgin Suicides. They have two daughters: Romy (born November 28, 2006), whose name is a homage to Coppola's brother Roman, and Cosima (born May 2010). Coppola and her family live in Paris. She said of the city: "The Palais-Royal, the Tuileries Garden, the Musée d'Orsay. You can tell I love the city, right? It's a filmmaker's dream there; the colors are beautiful!" ↑ Some sources give May 12, per "Sofia Coppola Biography (1971-)". FilmReference.com. Retrieved March 19, 2014. ↑ Silverstein, Melissa. "Sofia Coppola Wins Top Prize at Venice Film Festival". Women and Hollywood. Retrieved September 12, 2010. ↑ "Sofia Coppola Interview". The Talks. ↑ Armstrong, Lisa (June 4, 2008). "Sofia Coppola: I'm more interested in looking than being looked at". The Times. London. Retrieved June 3, 2008. ↑ Menkes, Suzy (October 14, 2008). "Sofia Coppola: Discreet, chic and grown-up". The New York Times. Retrieved July 29, 2009. ↑ Lee, Helen (November 5, 2007). "Did you know Sofia Coppola has a fashion line called MilkFed?". Sassybella.com. Retrieved July 29, 2009. ↑ "Sofia Coppola from Marie Antoinette – Celebrity Biographies at". Film.com. November 21, 2006. Retrieved September 12, 2010. ↑ Patterson, John (January 12, 2008). "If only... we could confine all nepotism to Los Angeles". London: The Guardian. ↑ Fresh Air. December 20, 2010. Event occurs at 19:25. 1 2 3 4 Gilbey, Ryan (July 4, 2013). "Sofia Coppola on The Bling Ring: 'What these kids did really took ingenuity'". The Guardian. Retrieved July 5, 2013. 1 2 "Sofia Coppola Biography". Tribute Entertainment Media Group. 2013. Retrieved July 5, 2013. ↑ "FFWD Weekly Interview - May 18, 2000". FFWD Weekly. May 18, 2000. Retrieved August 27, 2012. ↑ Lim, Dennis (December 10, 2010). "It's What She Knows: The Luxe Life". The New York Times. Retrieved July 5, 2013. ↑ "Out of the Godfather's shadow". The Independent. April 30, 2000. Retrieved August 27, 2012. ↑ Academy Invites 127 to Membership Archived June 11, 2007, at the Wayback Machine. ↑ "Festival de Cannes: Marie Antoinette". Cannes. Retrieved December 13, 2009. ↑ "Marie Antoinette - a Quotational Reference Guide". Big Screen Little Screen. Retrieved August 27, 2012. ↑ Siegel, Tatiana (April 16, 2009). "Sofia Coppola books Marmont film". Variety. ↑ Rome, Emily. "Sophia Coppola and a Cohen Brother talk Somewhere at DGA Screening". Entertainment Weekly. Retrieved August 27, 2012. ↑ "Sofia Coppola Reportedly Planning Movie On The Hollywood Hills Burglar Bunch; Tess Taylor Apparently Stars & The Playlist". Indiewire. Retrieved August 27, 2012. ↑ "Emma Watson To Star In Sofia Coppola's Next Film 'The Bling Ring' & The Playlist". Indiewire. February 29, 2012. Retrieved August 27, 2012. ↑ "AMERICAN HORROR STORY Star Taissa Farmiga Joins Sofia Coppola's THE BLING RING and JAMESY BOY". Collider.com. March 1, 2012. Retrieved August 27, 2012. ↑ Kit, Borys (March 6, 2012). "Leslie Mann, Israel Broussard Cast in Sofia Coppola's 'Bling Ring' (Exclusive)". The Hollywood Reporter. ↑ "Bling Ring 2013 Un Certain Regard Opening Film". Deadline.com. April 18, 2013. Retrieved April 18, 2013. ↑ "Sofia Coppola To Co-Write 'Fairyland' For American Zoetrope". Deadline.com. December 16, 2013. Retrieved December 29, 2013. ↑ "Sofia Coppola to Direct Universal and Working Title's "Little Mermaid"". Variety. March 18, 2014. ↑ "Sofia Coppola Drops Out Of 'The Little Mermaid'". Deadline.com. June 1, 2015. ↑ Hughes, Jason (October 21, 2014). "Bill Murray Talks Christmas Special With Sofia Coppola: I Guess I'll Do It' (Video)". TheWrap. Retrieved November 7, 2014. ↑ Jagernauth, Kevin. "Watch: First Teaser For Sofia Coppola's 'A Very Murray Christmas' With Bill Murray". Indiewire. Retrieved May 22, 2015. ↑ Miss Dior Chérie Commercial (Director's Cut). YouTube. 2008. Retrieved August 27, 2012. ↑ Nudd, Tim. "Ad of the Day: Sofia Coppola Directs 4 Oddly Charming Holiday Spots for Gap Love, but not understanding". AdWeek. Retrieved November 7, 2014. ↑ "Forget Versailles: When Sofia Met Paris". Elle. June 13, 2013. Retrieved August 2, 2013. ↑ "Valentino and Sofia Coppola Make an Opera". The New York Times. 19 May 2016. ↑ Vivarelli, Nick (September 11, 2010). "Coppola's 'Somewhere' wins Golden Lion". Variety. Retrieved September 12, 2010. ↑ "Sofia Coppola, Spike Jonze to divorce". USA Today. December 9, 2003. Retrieved July 5, 2013. ↑ Thorpe, Vanessa (December 6, 2009). "Spike Jonze: Master of the Wild Things". The Guardian. Retrieved July 5, 2013. ↑ "Oscar-winner Sofia Coppola weds Thomas Mars in Italian town of her ancestors". Daily Mail. August 29, 2011. ↑ "Exclusive! Sofia Coppola Gives Birth!". E! Online. November 28, 2006. Retrieved September 12, 2010. ↑ "People: Nicole Kidman, Sofia Coppola, Michael Richards". International Herald Tribune. March 29, 2009. Retrieved August 27, 2012. ↑ Chen, Eva (March 2009). "Beauty Blogger". Teen Vogue. p. 113. Though this explanation has often baffled journalists, it is generally believed that Coppola does, in fact, live in Paris, despite her superficial responses to questions about the city.